The screening of Kong: Skull Island that I saw was held at the Epic theater at MJR Troy, and I highly recommend watching it in a large-screen format like that: it made it very easy for me to become immersed in the film. Scientists Bill Randa (John Goodman) and Houston Brooks (Corey Hawkins) get permission from the government to explore a previously undiscovered island in the Pacific that has only recently been noticed on satellite imagery. They hire an Indiana Jones of sorts, James Conrad (Tom Hiddleston), just in case things go south ... which, of course, they immediately do, once the gang discovers that not only does Kong, a gigantic gorilla, guard this island, but the island is also inhabited by some lizard creatures who aren't too friendly either. Needless to say, Kong doesn't take too kindly to the scientists performing nuclear tests on the island - ie, trying to blow up his home - and chaos soon ensues. 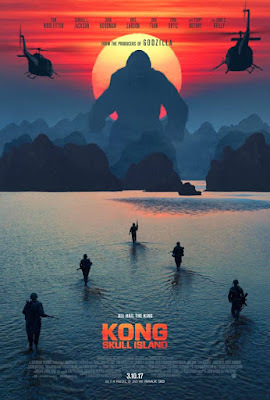 This movie really should have been called Giant Lizards vs. Kong: Skull Island - we don't see Kong the entire movie, but there's more than just Kong for our travelers to worry about. Goodman and Hiddleston were great here, as well as Brie Larson, as a photographer that tags along on the trip; John C. Reilly, who has lived on the island for the past 28 years after his plane crashed there during WWII; and Thomas Mann (Beautiful Creatures) as a young military man who does a great job of being scared witless throughout. Yes, definitely see this film. The detail that is put into Kong and also the lizard creatures is amazing - so much so that you'll want to look away from the screen at times. I was surprised to see that the movie is rated PG-13 - although the language isn't too bad throughout, the monster fights scenes are intense, and I wouldn't recommend this film for anyone under 15 or 16 (I'm 30, and had to look away a few times, when it got gory ...). That being said, this is probably one of the best monster movies I've seen in recent years, and is worth your money for either a nighttime viewing or a matinee. Kong: Skull Island is in theaters today, March 10th, and is rated PG-13 with a runtime of 120 minutes. 4 stars out of 5.